What happens when you take music games Beatmania, Keyboard Mania, and Para Para Paradise and mix them into one game? You get the Sega music arcade game Chunithm. The basics of Chunithm are simple. In front of you is a screen and a touch panel. Note bars come toward you on the screen (like in Guitar Hero, et al.) and you tap the panel just as the bar reaches the bottom of the screen. The patterns of these note bars in turn match the rhythm of the song that is playing. The note bars vary in size, with some taking up the full screen (meaning you can press anywhere on the touch panel to hit the note) to one sixteenth of the screen size. The touch panel itself, therefore, is sectioned off into sixteen lengthwise rectangles (somewhat resembling piano keys); to the touch, however, it is one smooth panel. 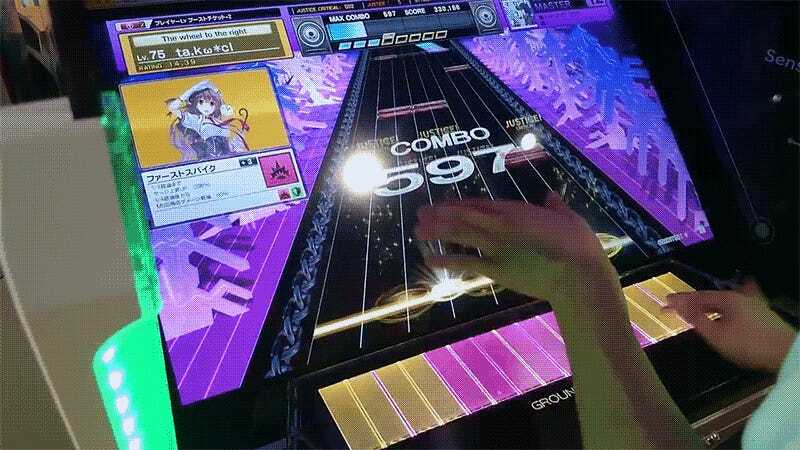 Instead of simply pushing buttons, much of Chunithm involves sliding a hand back and forth across the whole panel—often tapping additional notes with your other hand. Then comes the game’s twist—the inclusion of motion sensors on the sides of the cabinet. Some notes require you to lift a hand to about chest height and hold it there. Sometimes you need to hit notes while your hand is in the air by dropping it suddenly for a brief second. When it all comes together, it looks like this. Of course, half the fun of any music game is the set list. Currently there are 111 songs in Chunithm—with more being added on a regular basis. Many of these start out locked (so of course you’ll need to buy Sega’s Aime card to save your progress). While the current selection is nothing compared to Sega’s music game giant MaiMai, there are more than a few hits for video game and anime fans. The set list includes everything from Steins;Gate and Persona 4: Dancing All Night to Attack on Titan and Madoka Magica. But the thing that makes Chunithm so fun is that even when sucking at the game, it is a ton of fun. So if you find yourself in Japan (or someplace that has imported a machine), be sure to give Chunithm a try. It’s one of those experiences that can only be had in an arcade. Chunithm was released in Japan on July 16, 2015. There is currently no word on a Western release.